​Lori Franke is not your typical grassroots country singer. Born and raised in Calhoun County, Illinois, this former Marine and mother of three has been singing nearly her whole life. "I've been singing in front of large groups of people since I was 18," Franke said, "but I just had a lot of other things to do before I could get to this point in my life and devote more time to it." This country singer with an acute sense of style and tenacity for entertaining enjoys performing at various venues around the area. ​Franke gained local exposure with her debut release Sometimes, on the MW Production/Records label in November of 2004. Public response to the album was overwhelming. On the strength of tracks such as "Baby Wake Up" and "If Love Doesn't Matter," the CD began selling at a rapid pace. Lori's music sparked a lot of interest on various independent music Internet sites and was also featured on various play lists on Internet radio, WSMI being the most supportive! "I was blessed to have some of the finest songwriters/musicians in the area working with me on this project," says Franke. "I also had a supportive radio market to help me share what I love." While Franke enjoys playing out, she was more interested and song writing and performing locally so she could focus on being a mom, wife, and professional educator -- contributing to the world in a much bigger way by impacting kids positively. Franke has found her niche in music entertainment by hooking up with five very talented musicians, creating a very important link to her family - Miles Station Band. The band is comprised of base player and vocals Chris Hammann, Eric Cooper on lead guitar and vocals, John Hand on keys and vocals, Mike Musgrove on drums, and Jerry Price on rhythm guitar and vocals. Franke agrees that Miles Station is the "best support system one could have as all the musicians are extremely talented and have vocal abilities as well, making the musical fill a wonderful arrangement with every song." 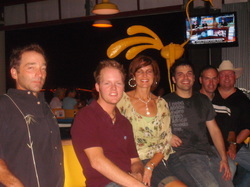 Miles Station is a high-energy variety band, performing current and traditional cover tunes with an innovative flare. ​​ Band schedule can be found at www.milesstation.com. It all started while preparing for the day. I always – ALWAYS listen to music while getting ready in the morning (and I usually dance around my bathroom when a rockin’ song comes on, but don’t tell anyone! J). The song, We Are Family began playing. The lyrics captured my attention. “We are Family! I’ve got all my sisters with me.” This line got me thinking. At Jersey, we are a family. We don’t treat each other as indifferent workmates, or as individuals who serve students independently of one another, and I can go on and on about what we are not. But what we are is a family. We care about and love each other and the students we serve. We love our community and want to celebrate all that we do together – powerfully and positively! That’s what makes us unique as a school district and community. What it makes us, though, is a strong family! With that said, I realized I had the PERFECT song to use for something grand! Now I pondered… What can I do to engage the community, have fun, increase awareness of who we are and why we exist, promote Just Be Jersey, build Panther spirit, and simply give us an excuse to ROCK OUT? I ran the idea by Mrs. Trochuck who served as my “right hand” at the district office. She liked the idea, so I felt inspired to share and began the planning process. I turned to Miss Erica Smith who is FAMOUS in Jersey county for ensuring that our community is painted blue. She knows how to create a spark, to make things happen, to brighten up our little piece of the world. I also looked to Coach McCreary, and requested the Poms participate in this event! Then I left it up to both fabulous women to brainstorm participants to help sing the song. They called on Judge Pistorius, Mrs. Taul, Mrs. Bittles, Pastor Stribling, Mr. Goetten, Mr. Griffin, Miss Bear, Mrs. Wackerly, and our own student, Miss Maggie Collins! And then (I believe) the Poms team and Miss Smith sent out an “anyone interested in participating” tweet or text to individuals, making them aware of our first practice. Several showed up! The AWESOME Miss Dannah McCreary choreographed the dance, and the Poms team and all participants (We had several kiddos and few adults make the practice.) worked tirelessly learning the dance. Everyone was so willing to do it repeatedly. It was AWESOME!!! We ran through the song about four times and felt ready to go for Friday. “We are family. I’ve got all my Panthers with me. On the big game day, we felt prepared. We had students (former and current), staff, administrators, community members (a few even from Southwestern- and we were psyched about that, too!) participate. We had Miss Jersey County, Little Miss Jersey County, and boys and girls alike participate. We had young and old, great dancers, and some who worked hard staying on beat! Simply put…we had a whole lot of JUST BE JERSEY going on in that dance – working together, dancing together, singing together, having fun together. We truly demonstrated that we are – in fact – FAMILY - one big, loving - happy FAMILY! And the message that I hope was spread throughout OUR Panther land? ALWAYS be kind and loving! Let US support one another! After all, WE are in this together as a family! Everyone –let US please - JUST BE JERSEY!